Volume 4, Edition 16 Trouble loading? View this email online. You can give back to CSUN through donations of time, food or money on this national day of giving. 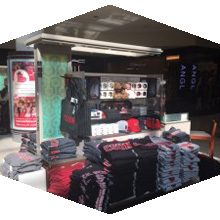 Matadors can gear up on CSUN merchandise such as T-shirts, hoodies, keychains, notebooks, mugs and much more at the Northridge Mall throughout the holiday season. 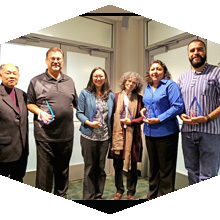 EOP at CSUN celebrated its long tradition of “paying it forward” by honoring CSUN leaders Virginia Hyunh, Sharon Klein, Alex Ojeda, Frank Muniz and Jina Gonzalez at the 2016 Don Dorsey Excellence in Mentoring Awards ceremony. Sat, Dec. 3, 4 p.m. and 6:30 p.m. The Men’s team will open up the evening at the Matadome against the Idaho State Bengals. By showing your ticket stub from the opener, free admission will be provided to see the Women’s team against Eastern Washington. Sat, Dec. 3, 7 p.m.
Mariachi Garibaldi of Grammy Award-winner Jaime Cuéllar and the Ballet Folklórico de Kareli Montoya perform an evening of dance and songs such as Campanas de Belen, Amarga Navidad, Navidad de los Pobres and other iconic songs of the Christmas season. Tue, Dec. 6, 7:30 p.m. The CSUN Orchestra, Wind Ensemble and Jazz “A” Band will perform holiday-themed pieces alongside some special guests at the inaugural Music Holiday event. Join us for an on-campus 5K, with proceeds going to the CSUN Matador Care Fund. And if it’s your first time, don’t sweat it. You can jump into training sessions run by one of our CSUN Kinesiology students. CSUN will be celebrating its biggest welcome back to campus since its 50th anniversary Grand Reunion in 2009 when Homecoming returns to CSUN on Feb. 11, 2017. We are celebrating all Matadors with a day full of entertainment and games, food and drink, and a showcase of our thriving campus. CSUN alumna and CEO of Connecting Talent Company Jody Prusan has answers on emerging trends in the entertainment industry. Gain some valuable insights at the latest Breakthrough Breakfast Event, Leveraging Psychology for Business: The Five Things You Need to Know. Guest speakers will be CSUN Psychology professor Abe Rutchick and Andrew Chizever, vice president, general manager of Lieberman Research Worldwide.